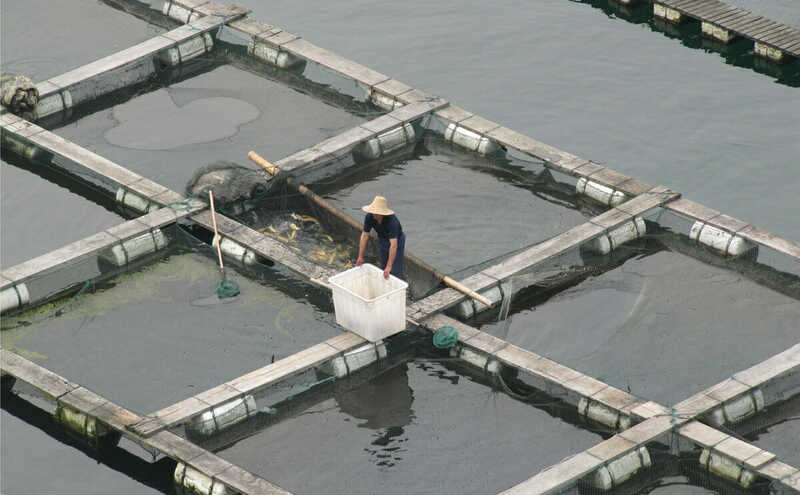 Many of the issues with aquaculture, or fish farming, are well documented. Farmed fish compete for space against wild fish, and they carry new parasites and diseases. They contribute to water pollution and often eat wild fish, further depleting overfished populations. Now a new issue has bubbled up to the surface. Extracting groundwater for use in these fish farms can cause the land to sink and sea levels to rise. Coastal subsidence (the term used to describe what happens when land compacts after the water helping to hold it up diminishes) and higher sea levels can be detrimental to the health of coastlines by heightening storm surges, intensifying flooding, and accelerating shoreline retreat. A new study published in Geophysical Research Letters researched the land subsidence at aquaculture facilities along China’s Yellow River Delta and came to this alarming conclusion: The subsidence is causing sea levels to rise nearly 100 times faster than the global average. The delta is dominated by aquaculture and has experienced severe coastal erosion (up to 25 centimeters a year). Fish farms were built along the coastline of the delta starting in the 1970s, and by 2001 over 250 billion gallons of groundwater were extracted a year. Asia produces 89 percent of the world’s farmed fish, and much of this production occurs in river deltas. The Yellow River Delta is just one spot that raises concern. The study notes that fish and shrimp ponds have become the boundary between land and sea along the Pearl River Delta, which is also in China, and the Mekong Delta, in Vietnam, where over 600,000 acres were converted from rice paddies to shrimp ponds in 2000. The increase in sea levels produced by aquaculture will only grow larger, the study concludes. Globally, about one-third of the fish people consume is produced by aquaculture. And the study finds that the number of fish farmers has quadrupled in the last two decades, as farmed fish has become an important source of protein for the world. A review of the study in Nature finds the link between aquaculture and subsidence is fairly unknown.